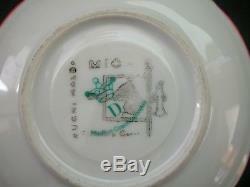 Rare Vintage China Art Deco. 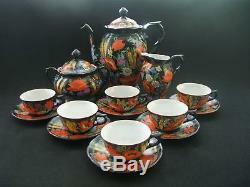 15 Piece Coffee Set Czechoslovakia. Cup diameter excluding handle: 6.5cms (2 5/8 ins). 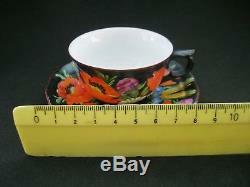 Cup height excluding handle: 3.5cms (1 1/2 ins). Saucer diameter: 10.5cms (4 1/8 ins). 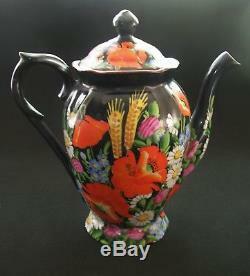 Coffee Pot Height excluding lid: 15cms (5 7/8 ins). Coffee Pot length handle to spout: 18cms (7 ins). Milk Jug length handle to spout: 9cms (3 5/8 ins). 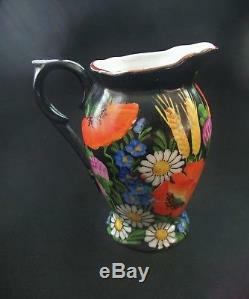 Milk Jug Height: 9cms (3 5/8 ins). 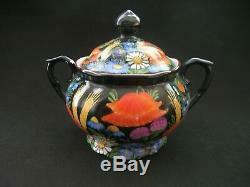 Sugar Bowl diameter: excluding handles 9.5cms (3 3/4 ins). Sugar Bowl Height excluding lid: 7cms (2 3/4 ins). 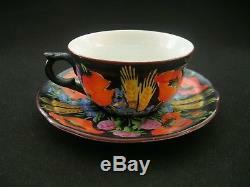 This full hand painted set is a rare art deco vintage treasure! This complete 15 piece demitasse set includes a coffee pot with lid, six tiny cups and saucers, lidded sugar bowl and a milk jug/creamer. 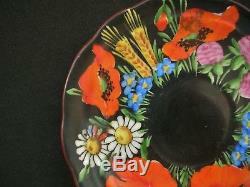 All black with bright painted flowers and each item is slightly different. 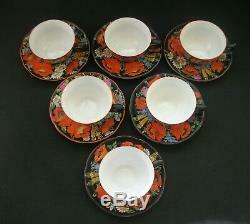 The set is a vintage original and would be placed around the 1930s Art Deco era, made in Czechoslovakia. This is a stand out set, especially as the condition is almost mint! Two of the saucers have additional flowers painted in the centre, these two also have additional backstamps. 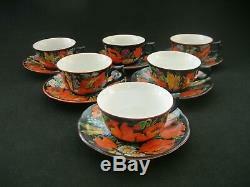 Two of the cups have a bright orange rim, the other four a darker orange/brown rim. The sugar bowl has lost a touch of the black colour next to one handle. A close up pic is provided. Some of the saucers have a touch of wear to the black, but really quite minor, just tiny spots. Again, same with the coffee pot, small spots of missing colour, mainly the rim and end of the spout. The cups, a teeny spot of black missing to one or two of the cups (hard to see) and one cup has a few small black spots to the inside, still minor... Otherwise all the other items are in generally excellent vintage condition commensurate for age. The inside to all items is white and clean, not discoloured, looks like it has never been used. No crazing, chips, major discolouration or other damage. Some normal age related wear to be expected. Made in Czechoslovakia with Crown stamp and D. Looks like the Czechoslovakian Wolfdog head. Please look at the photos carefully as they form part of the description. There are additional photos which can be sent to you on request or viewed on our Facebook page. Why our customers love us! Another great quality item from. Parcel registration is recommended as an optional extra. Contact Red Beards Treasure House now! Subscribe to our store newsletter to receive exclusive special offers. Australia Post Pack and Track post. All fragile items are securely packed. Please use calculator for rates to your country. We can price the following options to your country on request. Welcome to Red Beard's Treasure House, the home of fantastic collectables, china, art, furniture and antiques. Our treasure trove is constantly growing, so check back often! The item "Vintage China Demitasse DITMAR URBACH COFFEE SET Black Floral Czechoslovakia" is in sale since Friday, March 1, 2019. 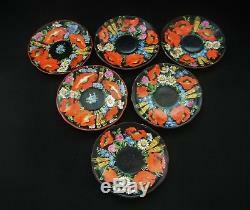 This item is in the category "Pottery, Glass\Pottery, Porcelain\European Makers". 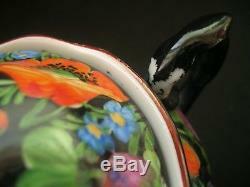 The seller is "redbeardsa1" and is located in Allambie Heights, NSW. This item can be shipped to Australia, all countries in Europe, United States, Canada, Hong Kong, New Zealand.